If there is one juice that I could add to EVERY one of my juice recipes, it would be pineapple juice. There’s just enough tang and tart flavor in the juice to drown out the taste of veggies like kale or broccoli, but it’s sweet enough that it makes the juice enjoyable. I don’t think I could ever tire of pineapple juice. It’s supremely versatile, and it goes well with pretty much every fruit and veggie on the planet! Here’s a short video showing how to cut pineapple and make fresh juice! One of the top pineapple juice benefits lies in the health doses of antioxidants the fruit contains. Pineapples contain A LOT of Vitamin C, one of the most important antioxidants for a healthy immune system. Vitamin C is also very effective at getting rid of free radicals, and you’ll find that adding pineapple juice to your day will help to reduce the damage these radicals can do to your body. For men who are worried about their heart, one of the primary pineapple juice benefits is its ability to fight heart disease. The Vitamin C in pineapple juice will prevent the oxidation of cholesterol, thereby preventing it from turning into artery-clogging plaque. Pineapples are also loaded with potassium, the mineral that helps to balance the amount of water your body stores. Too much sodium and not enough potassium can lead to high blood pressure, so drinking the potassium-rich pineapple juice is an excellent way to ensure your electrolytes are balanced. What stops you from losing weight? Often, it’s just a desire for something sweet and tasty. (Stupid cravings!) Pineapples are loaded with natural sugar, making pineapple juice very effective at dealing with those sugar cravings you get while on a diet. Pineapples also help you to feel full if you eat them at the close of a meal, so it’s a good idea to finish off your lunch or dinner with a glass of pineapple juice. Vitamin C is one of the most powerful antioxidants in the world, and yet the average person gets nowhere near enough of it. If you want to stay healthy, you’ll add more of the vitamin to your diet. It will give your immune system a boost, ensuring that your body is protected from the myriad bacteria, viruses, fungi, and germs you come in contact with every day. Pineapples also contain bromelain, a compound that can fight off microbes and germs. It’s even recommended that you try pineapple to deal with coughs and colds! Your bones need calcium to be strong and healthy, but they also need other minerals like silicon and manganese. Pineapples contain a lot of manganese, so just a cup of pineapple juice will be enough to give you nearly ¾ of the manganese that you need every day. It not only works to strengthen your bones, but it will fortify the connective tissues (tendons, ligaments, etc.) around your bones–thereby reducing your risk of injuries drastically! As you age, the cells in your eyes tend to break down. This is called macular degeneration, and it’s something that happens to most people. However, one of the best ways to prevent this degeneration is by increasing your Vitamin A intake. Pineapple juice contains beta carotene, a nutrient that your body turns into Vitamin A. For healthier eyes, drink more pineapple juice. Pineapples aren’t just effective at fighting free radicals (as mentioned above), but they can also deal with cancer directly. Men will find that pineapple juice benefits for men affect them, as the juice has proven effective at fighting prostate cancer. It’s thanks to the beta-carotene in the pineapple that cancer is dealt with effectively! Pineapples are loaded with healthy fiber, but there’s none of that fiber in the juice you squeeze from your pineapple. What there is, however, is lots of liquid! The high water content of pineapples (ergo, pineapple juice) helps to reduce your risk of constipation, improves the health of your digestive system overall, and ensures regular waste elimination. Pineapple juice is excellent at keeping your digestive tract healthy! Did you know that one of the top benefits of pineapple juice for women affect their reproductive systems? The antioxidants in the pineapple juice will increase their fertility, and getting rid of the free radicals in the body will double down on the reproduction-boost offered by the tropical fruit. The minerals in pineapple juice–zinc, copper, beta-carotene, folate, and others–will help both men and women to have healthy reproductive systems. For people trying to have children, drinking more pineapple juice can increase your chances of conception. Eating pineapples or drinking pineapple juice is one way to improve the health of your skin, but even applying the juice directly to your skin as a natural “lotion” can go a long way! Vitamin C is one of the most important nutrients to consume if you want to have healthy skin, as more Vitamin C means your skin can produce more collagen and elastin. Increasing your consumption of this vitamin via pineapple juice will help to speed up skin healing, reduce wear and tear on your skin, and even improve the texture of your skin. 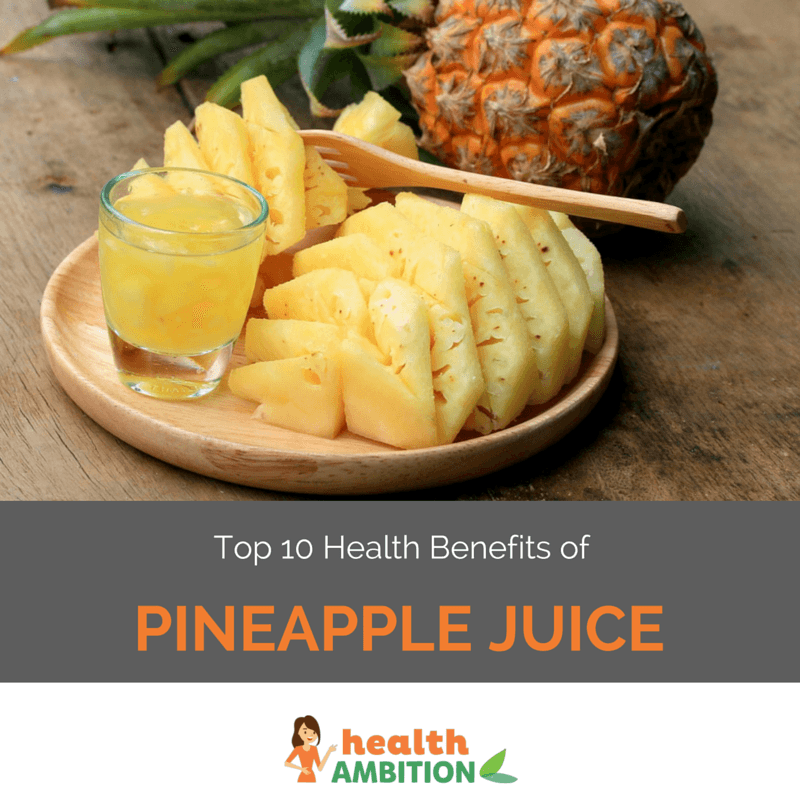 These may be the top ten pineapple juice benefits, but there are many more! The truth is that pineapple is one of the most versatile fruits on the planet, and it offers a wide range of benefits that is matched only by its amazing flavor! The Best Juicing Recipes for Weight Loss – Tasty and Effective!